The ScreenGuard compression fit skylight guard installs easily without tools. The large format metal mesh bows enough to allow the ends to be fitted at the end skylight frames. 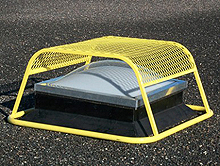 A strong fall protection guard against rooftop workers falling into the skylight. Protect dome style skylights from flying debris, hazardous weather and rooftop worker damage with these curved skylight guards that also protect workers from falling through a dome skylight while on the job. Create an affordable rooftop ladder safety ingress and egress zone quickly and easily with the LadderGuard system. Rail sections aid in transitioning from climbing to standing and provide a safe zone that runs in 6 foot from the roof edge. Protect workers from tripping and falling into a roof hatch with this rail kit that satisfies OSHA hatch safety standards. The snap-together rail system includes a self-closing gate that prevents accidental entry into the guarded area. Optional grab bars enhance safety when climbing in or out of the hatch. Easily assemble a safety cage around skylight or floor opening hatches with this fall protection guard that help keep workers safe. Angle corner posts, base plates and side rails combine to provide a sturdy rail system to prevent dangerous falls over rooftop obstacles.